We offer both group and private horseback riding lessons for children and adults at all levels of riding experience. There is no age requirement on private lessons. We have a horse for adults or children and a large pony for children and a mini for little ones. We can find a good fit for you whether you are a beginner or an experienced rider. 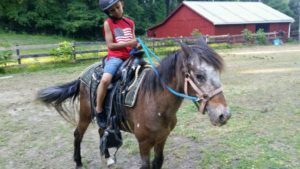 For beginners, the first half of the lesson will focus on learning techniques to control the horse and the basics of grooming, saddling, and mounting. The second half will be riding time. This can be done in either a private or a group setting depending on your preference. Booking by the month saves you $5 per class. Payment must be received at least 24 hours before the start of the first class. Lessons booked by the month are not forwarded into a new month and there are no refunds for missed lessons. To qualify for a make-up lesson, you must notify the barn that you will be absent. At Door Lesson prices are in effect for those students paying less than 24 hours in advance or immediately prior to the lesson. Lessons may be paid for in cash, by check. To help save time, please print out, review, and bring a signed release form with you to your first lesson.